Helsinki, 23.5.2018 Icareus has delivered a turnkey HbbTV solution to ATV, the leading commercial broadcaster in Turkey. ATV wanted to offer more to their viewers and to understand better how their channels are watched, so they turned to Icareus to design and deliver a complete SmartTV service based on HbbTV (www.hbbtv.org). Icareus build a turnkey HbbTV solution based on its existing products that enabled ATV (www.atv.com.tr) and its sister channels A Haber, A Spor and children’s’ channel Minika to offer valuable services to their viewers via SmartTVs. The delivered solution consists Icareus Playout CS100 for HbbTV signalling, Icareus Suite platform for cloud-based HbbTV service management, Icareus Audience Measurement solution and an assortment of HbbTV applications for all the four channels. Icareus HbbTV solution was selected because it offers an economical and the most feature rich HbbTV platform on the market. Icareus solutions have been tested and deployed in production use for years. The solution offer ATV the most flexible and modular platform to provide better TV experience for their TV viewers. Icareus Suite is a cloud based versatile TV and online video platform. It is targeted for TV operators and broadcasters to manage their IP and Broadcast based hybrid TV services, SmartTV applications and other content. Icareus Suite provides an easy-to-use web management interface to manage service delivery, analytics, and customisation of HbbTV Applications. Icareus Suite enabled ATV to adopt the applications look-and-feel to each channel’s own brand without any programming and thus decreasing the both the deployment time and cost, to a cost comparable to a single channel deployment. Icareus Suite is a modular platform and in addition to HbbTV application management its core modules include asset management for VOD and Catch-up TV, EPG management, payTV provisioning, subscriber-, device-, and account management. Icareus Suite can be offered as a cloud service, but ATV preferred a on-premise installation. Icareus Playout Carousel offers Trusted Broadcast Technology enjoyed by leading broadcasters and operators globally for over a decade. Icareus’ Playout CS100 Carousel™ is the solution for TV operators and broadcasters for DVB datacasting services. Icareus’ Playout CS100 Carousel Server allows the building and supervision of high quality value-added television services by multiplexing data in real-time. Icareus’ Playout CS100 Carousel server supports HbbTV and other interactive TV standard based applications. 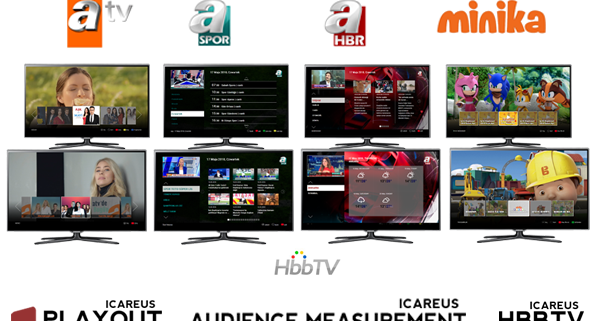 Icareus Audience Measurement solution provide tools for TV Operators, broadcasters and other service providers collect and analyse information about their audiences, either watching or using their TV services. The information can be collected from any device connected to the service including HbbTVs, set-top boxes, SmartTVs, tablets, mobile phones and wed services. Icareus Audience Measurement solution provides ATV the valuable real-time data on how viewers watch their channels, on-demand videos and interact with their TV applications. The real panel of 2 million TVs connected to Icareus system provides insight that any other solution could not deliver giving ATV an edge to offer AddressableTV on phase two of the project. Launcher application, which is autostarted on all channels and takes control of desired buttons (color buttons mainly). Each button can be assigned with a scheduled action. Includes support for showing scheduled banners and linking to advertisers own portals. The solution is future-proofed allowing ATV to easily and quickly deploy and customize new HbbTV applications thereby avoiding the need to develop new applications from scratch.